Details: 3 Bedroom, 3 Bath Vacation Rental, Sleeps up to 7. Beach Colony Resort Vacation Rental, beach resort home in Perdido Key Florida. Welcome to our luxurious and fully equipped condo in the exclusive Beach Colony Resort, a private gated community. With an ideal third floor location, you will enjoy an incredible view of the gulf and pool without the uneasiness of being on a high floor. Each floor in the building has only four units with private elevator access codes. This condo boasts three large bedrooms, each with a private bath and balcony. The master suite is equipped with a king-size bed (with new, top of the line mattress), two night stands, large chest and armoire. Storage will not be a problem with many oversized deep drawers plus a huge walk-in closet. The master bath has a long double sink vanity, separate shower and a large whirlpool jetted tub. The master suite also has 'floor to ceiling' window/door with direct access to the main balcony overlooking the ocean. A pristine portion of the Gulf Islands National Seashore is located on the eastern part of the island. Perdido Key State Park, a popular destination for visitors, offers unspoiled white-sand beaches in a subtropical climate - Perdido Key FL is the perfect place for a family vacation to enjoy popular outdoor activities on the Gulf Coast - this resort community is a great place for families Experience popular Perdido Key restaurants like the Fisherman's Corner, Sea-n-Suds, The Crab Shack, Lillian's Pizza, etc. and enjoy some of the freshest seafood anywhere. 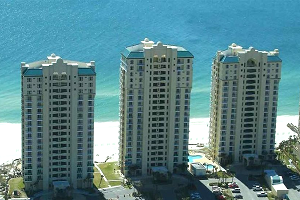 There's no shortage of Perdido Key lodging options, from vacation rentals by owner and popular hotels nearby - plus a variety of resort property including beachfront condos, for anyone interested in their own slice of paradise.. Whether you’re ready for fun and adventure, a relaxing day on the beach, a real estate investment, or tasty cuisine - you can find it all on Florida’s Gulf Coast.